Trouble with a blocked email message? Sending email from your domain can be problematic at times. This article primarily deals with sending email from a public ip and using Non-SSL Settings for POP email. Most clients have their mail server hosted remotely but the IP address you send from is the one checked sending email using the default settings for POP email. If your messages are not being delivered then you may have an IP address with a bad reputation that is being blocked by a server application like Barracuda’s Spam Blocker. Your IP address may be on one or more blacklists. This usually happens with a new account or an account that utilizes dynamic IP addresses. You can troubleshoot this problem by taking down the anti-SPAM applications off-line if you control the server. If you don’t control the server you can utilize sites like mxtoolbox to review the history of your IP address. This will tell you if your IP address is on a Reputation Block List (RBL) or blacklists. Once you know that you have issues with an ip you should consider using Secure SSL/TLS Settings to connect directly to your server. If your ISP provides you with a dynamic ip you can try acquiring a new ip and check the repuation on it. Typically this is done by turning off power to the ISP’s modem. If you have static ips you can ask for a different block but this may require you to make changes at the registrar if those ips are used for the public. A good solution for a blocked ip is to connect directly to your server using Secure SSL/TLS Settings thereby bypassing the RBL and blacklists. This means that you will now be using the IP address of the email server rather than the local IP address of your PC. To authenticate using Transport Layer Security (TLS) or its predecessor, Secure Sockets Layer (SSL), you need the port that your server accepts. A common port for sending email that bypasses RBL checking rules is 587. Check your host’s email client setup for Secure SSL/TLS Settings. Connecting directly will avoid IP address bans from your location, but you need a certificate in place that satisfies your email client (e.g. Outlook). It’s common for hosts to use a common certificate for a server. While the common certificate will work, Outlook has a nag screen stating “the name on the security certificate is invalid or doesn’t match the name of the site” the 1st time you send an email in a session. 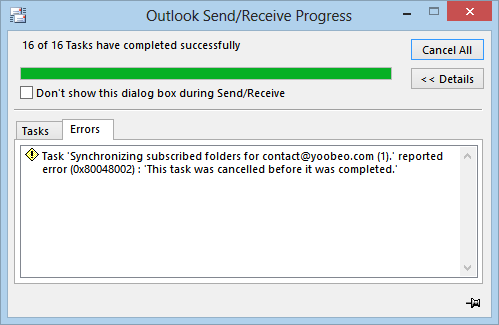 Click Yes to proceed and sending email will continue working until you restart Outlook. Installing the certificate won’t help so don’t bother with viewing and installing the certificate in this instance. Some hosts will allow you to purchase SSL via 3rd parties like Comodo but others will require you to buy from the host. The hosts that allow you to buy your own certificate will assist you in the installation if you have managed hosting. Otherwise you may have to install it yourself. The hosts that require you to purchase from them generally do the install for you. If you are not on a block list then you probably have port and/or mail server name issues. Most hosts have an Email Clients page that lists server names and associated ports for both Secure SSL/TLS Settings and Non-SSL Settings. Here’s a good example of a Email Clients page from GoDaddy. Some hosts like GoDaddy have autodiscover scripts that will attempt to find your servers and ports automatically. There are occasions where the autodiscover scripts are your best bet. You may have to logon to your hosting account to access the email client setup for your specific hosting plan. We will assume that your mail server is not on a blacklist for this article but you should contact your host if that’s not the case. If for some reason your host was blocked and you didn’t want to change hosting, you could move the email hosting. Moving email hosting invloves pointing your email server (e.g. mail.domain.com) to the new host via your registrar.